Ole Gunnar Solskjaer wants Manchester United to build on their 2-0 FA Cup win over Chelsea at Stamford Bridge on Monday night by going all the way to the final. The result not only secured a quarter-final tie against Wolves but showed that his players were unfazed by their defeat to Paris Saint-Germain in the Champions League last week. 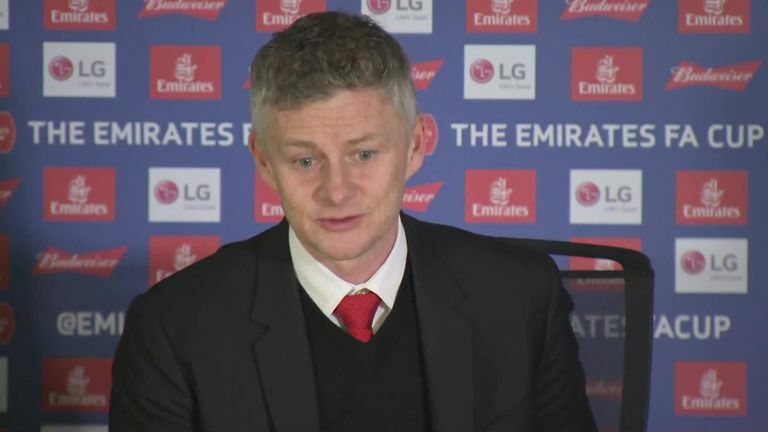 Ander Herrera and Paul Pogba scored the goals in the first half and Solskjaer was delighted to see a reaction from his team to their European disappointment. Paul Pogba was the star as Manchester United knocked Chelsea out of the FA Cup. "You want to see a reaction," he said. "The players have been brilliant in training. We were quite confident going into this game that we had found the right team selection and temperament. There's a balance between being too eager after losing a game, so today was brilliant. "We've got to build on the positives tonight. We play Liverpool next week, but Chelsea, Arsenal and us will fight for that fourth position. There are three good teams fighting for that one position. But this was about getting through to the next round. "We lost the final to Chelsea last year. My last game was a loss to Chelsea in the FA Cup final. Last time we beat them in the cup was 20 years ago, apparently. "We want to get to the final. It'll be a tough away game against Wolves, but it seems like both we and our fans love the away games. It didn't feel like an away game with that support behind the goal." As for the scorers on the night, Solskjaer was full of praise for their contributions with Pogba, in particular, bouncing back from his red card against PSG with a strong display. "Tonight was a great response, playing against one of the best defensive midfielders in the world with [N'Golo] Kante next to him," said the United boss. "We know he's one of the best attacking midfielders in the world. He has vision, so the cross for Ander's goal was fantastic. Then the way he plays the ball out to Marcus [Rashford] and gets into the box for the second was fantastic, too." Speaking about Herrera, he added: "His energy and tenaciousness is vital for us. That's why he plays almost every game. He has loads of energy, covers the right hand side, runs forward. "But tonight you can't just praise one. It's 11 players, plus the subs."